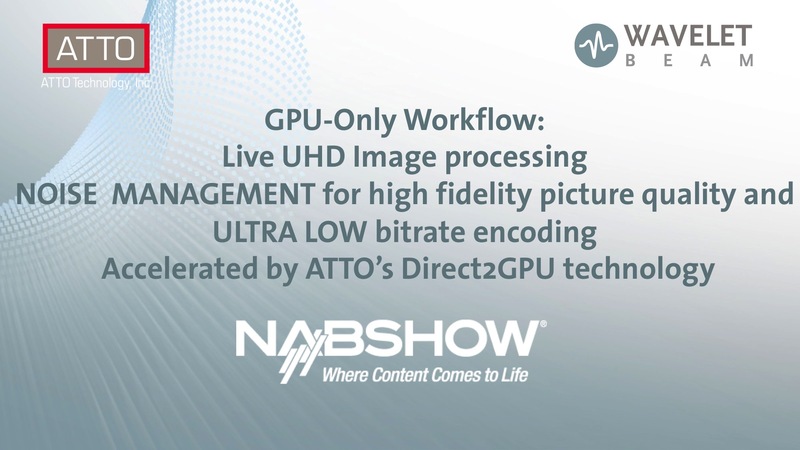 This year Wavelet Beam will showcase a GPU-Only Workflow at NAB together with technology partner ATTO (South Hall (Lower) - SL8716). The LIVE UHD video noise management with more than 30fps on a single GPU will be accelerated by ATTO’s Direct2GPU technology. Direct2GPU is a technology to load image data directly over the PCIe bus into the device memory of the GPU. Without any CPU load the new high performance workflow enables you to scale your systems without any limits. High fidelity picture quality and ULTRA LOW bitrate encoding for resolutions up to 8K are available today. Please ask for the Wavelet Beam Direct2GPU demo at the ATTO booth (SL8716) . The LIVE demo will give you the possibility to enjoy the Wavelet Beam high fidelity denoising technology on a 10bit monitor.